As the name suggests, aioli is French and originates from the southern region of Provence. It’s very similar to mayonnaise, only with garlic. It may or may not include lemon juice and / or mustard. Classically used as a dip for radishes, it works well with most raw or cooked vegetables. It’s especially good with new potatoes or chips I’ve recently discovered. I’d not tried making either mayonnaise or aioli in my Optimum 9200 Next Generation blender before, so I thought I’d give it a try. Mayonnaise is quite simple to make by hand with a bowl and whisk, but if you want the garlic to become fully incorporated, it’s best to make aioli with a food processor, hand held blender or stand blender. I decided not to use mustard, but to add some dill as we have plenty growing down on the plot at the moment and I thought it would make a nice addition – it did. As we were planning on using it as an accompaniment to potatoes I thought a little sharpness would be a welcome addition too, so I used a fair amount of lemon juice. As usual, my Froothie blender did not let me down. The resulting aioli not only tasted fantastic, but it was completely smooth. When I’ve made it before in my food processor, it’s always been slightly lumpy. Oh my. The dill gave a hint of flavour, the lemon made it brighter and fresher somehow and the freshly harvested garlic was the star of the show. 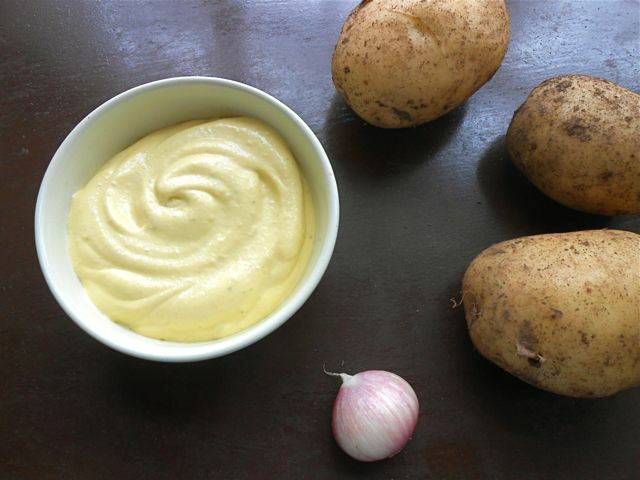 A quick and easy method of making aioli, sometimes called garlic mayonnaise. Use as a dip for radishes, carrots, celery and other raw or cooked vegetables. Place everything except the oil (& 1 tbsp lemon juice) into a jug blender and blend on medium speed for a few seconds until everything is smooth. Remove the plug from the lid and turn the blender to slow. Slowly trickle in the oil, increasing the flow as it blends. It's important to only add a small amount to begin with to avoid the oil separating. Turn off the blender as soon as the oil has been used up and the mixture has emulsified. It should be thick enough to use as a dip, but still have plenty of give in it. Taste the aioli and if not lemony enough, add the final tbsp lemon juice and blend briefly. Scrape out of the blender into a suitable serving dish and enjoy. Will keep covered in the fridge for a couple of days. With garlic and dill being harvested right now, this aioli is bang on season, so I’m sending it off to Ren Behan for Simple and in Season. The dill also makes this eligible for Cooking with Herbs over at Lavender and Lovage. Mmm, that looks great. Dill sounds like a great addition. Well there’s nothing quite like homegrown, but it can be hard work and dispiriting too when the wildlife eat everything. I love aiolis, they seem to be all the rage at restaurants here in Canada these days – though I’m surprised they’ve not been popular for decades! Aiolis and fries fried in duck fat. Those seem to be a lasting trend in Toronto this year. Though to be honest, duck fat fries are nothing special! This looks gorgeous. I love making my own mayonnaise and want to give this a go now. Oh wow – aioli is one of my favourites – might be a bit dangerous for me to know how to make it. Thanks for linking to KneadWhine! I love aioli but have never been brave enough to make my own, this recipe looks fab. Definitely going to give it a go. It’s not difficult Sus, even if you make it by hand, though that obviously requires a bit more effort. Go for it. I’ve had aioli in the South of France and always loved it. Yours looks so yellow and delicious, must try this at home! It was even more yellow in reality Lucy, but I couldn’t quite get the colour in the photo. Thanks Manu, it really does make for a simple but delicious summer meal. Wow! That looks so creamy and delicious. I love garlicky aioli, but I have never tried making it. You make it sound so simple!!! I could eat a whole bowl (especially with chips)…..
We just finished it off the evening Kate and had it with new potatoes again. And soooooo good with chips too. Give it a go. I have never tried this, but I know that I would love it as I’m a huge fan of garlic. If you like garlic, you’ll love this and it’s really easy to make too. wow delicious! added to my recipe collection. Thanks Dominika, do let me know what you think if ever you do make it. I wasn’t too sure about the Froothie either Fiona, but thought it was worth a go AND it worked splendidly. So easy. Give it a go. Well I never! No really, I have never had aioli with potatoes but I like the sound of it very much. Ha Janice, you are missing a treat. Apparently aioli and chips is the in thing in all the trendy restaurants now. I did actually try some a few weeks ago and it was a pretty good combination. But actually plain boiled new potatoes work wonderfully too. Aioli is one thing I haven’t made yet. Must try with the Froothie! The Froothie makes it so easy to do Michelle. 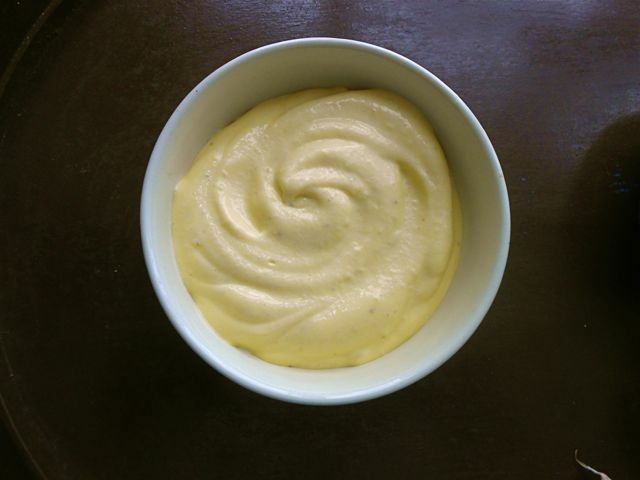 Mmm nothing beats homemade aioli, and it’s so easy to make too! Gorgeous recipe!